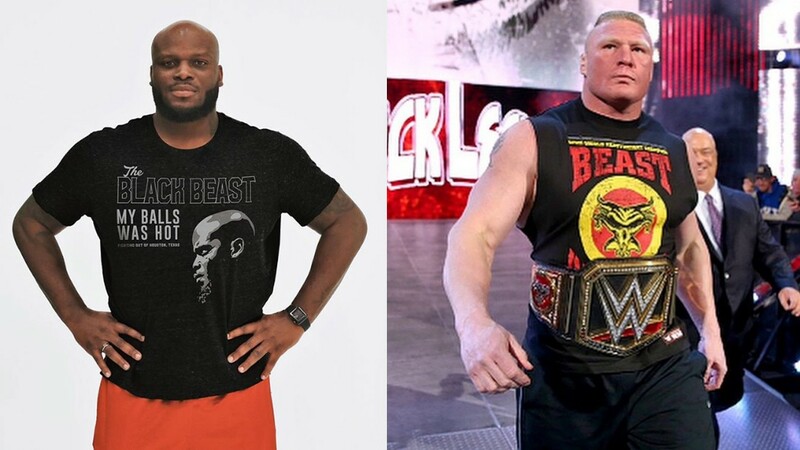 Derrick Lewis Plans To Attack Brock Lesnar In Khabib Style After Daniel Cormier Win! Derrick Lewis Has An Amazing Plan If He Defeats Daniel Cormier At The Main Event Of UFC 230! Derrick Lewis has quickly become one of the funniest men in UFC Heavyweight division. Let’s remember, Lewis was put under heavy criticism after his disappointing performance versus Francis Ngannou at UFC 226. After his amazing UFC 230 promo video, where he trolled Daniel Cormier, he won the hearts of many fans. But Derrick Lewis has another funny idea in his mind. He claimed that he wants to leap over the fence and attack Brock Lesnar when he defeats Daniel Cormier. According to Lewis, his plan is “Eagle-diving”. But if he wants to attack “The Conqueror”, Derrick Lewis must defeat Daniel Cormier first. Daniel Cormier knocked Stipe Miocic out at UFC 226, so “Black Beast” has to be aware “DC” knows to punch off the clinch. The two are set to fight for the UFC Heavyweight title on November 3rd inside Madison Square Garden in New York City, New York. Derrick Lewis was a very lucky guy since UFC couldn’t find a suitable pair for UFC 230 PPV (pay-per-view) main event. He defeated Alexander Volkov at UFC 229 via spectacular KO. When he spoke to Joe Rogan after the fight, he didn’t wear the shorts. Lewis was asked why he took his shorts off, but he gave one of the funniest statements ever. “Black Beast” said “his balls was hot“. Lewis also accepted the Heavyweight title shot on a very short notice. If “Black Beast” lands one heavy punch, “DC” might even be dethroned in the first round. Would you like to see another post-fight riot?